Birefringence refers to the fact that some materials have more than one refractive index, causing light beams hitting a birefringent material to split into two parts. Since such materials are uncommon, at first glance this may appear to be a rather startling phenomenon. What we have shown in recent work is that birefringent materials that have gradient indices of refraction -- meaning they are a function of position inside a material -- can do even more surprising things. Why do some natural materials have two refractive indices (one for each polarization)? The refractive index of a material comes from the way light interacts with electrons inside a material. Because different materials have their atoms packed together in different arrangements, their electronic structures are different. In many materials, like glass or water, those electronic structures look more or less the same when viewed from any direction or along any angle. Such materials are isotropic and have just one refractive index. Other materials, such as calcite or lithium niobate, however, have crystalline structures where the electronic configuration is different along some directions compared to others. It’s thus natural that some materials would have more than one index of refraction, depending on the polarization direction of the light. When light containing a mixture of randomly polarized photons strikes such a material, it exhibits double refraction. Birefringence is important for metamaterials researchers because it is often something that pops up where it is unwanted. One doesn’t want to design a new and exciting lens only to see that half of the light isn’t going where you want it to go, but in fact this is exactly what happens in a lot of cases. Many exciting and astonishing devices designed in recent years, such as cloaking devices, depend on a technique in optics called transformation optics [2-7]. It is a toolset that allows researchers to determine what refractive index profile will allow light to behave in a predefined way. Normally, such devices have gradient indices of refraction and require materials that have properties that are not commonly found in nature (or are even impossible or unfeasible to ever build). Transformation optics, for instance, requires the magnetic permeability tensor to equal the permittivity tensor. Since this is unworkable in real materials, a compromise is commonly made in order to actually build some of the amazing devices that researchers have designed: one polarization is sacrificed [8-9] to ease material property constraints. This is the origin of the “unwanted” birefringence. What we have discovered is that the “unwanted” birefringence can do useful things. We can actually design devices that are fully dielectric (removing the most onerous requirement of transformation optics) and have two unique functions, one for each polarization. Figure 1, for example, shows a spherical device that is invisible for one polarization, but acts like a so-called Luneburg lens for another. Without careful consideration, it may seem obvious that such devices are possible – why not just pick each of the two constituent refractive indices in a gradient birefringent device to each perform its own function? The reason why it is not so simple is because as light propagates through a structure, especially a structure with a graded index tensor, the polarization direction itself will rotate. Thus a light beam’s trajectory depends on each of the two indices in a complicated way, and before now, it was not clear whether the two trajectories of a single incident beam could be independently designed except in a few circumstances . 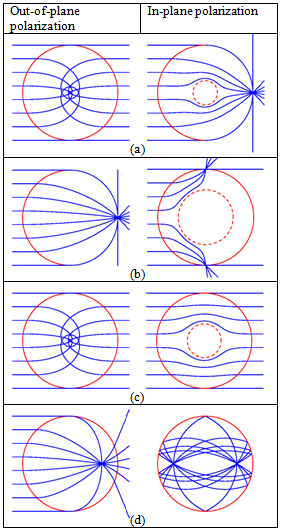 Figure 2: Four examples of birefringent dielectric devices designed with the methods described: (a) Invisible for one polarization, a Luneburg lens for the other as shown on the cover art, (b) a Luneburg lens for one polarization, and a ring focuser for the other, (c) Invisible but with a polarization-dependent phase slip, and (d) an interior-focusing potential for one polarization and a Maxwell fisheye for the other [Image reproduced from Ref . Thanks to 'Nature Photonics']. What we have shown is that, in fact, for all intents and purposes, they can be. This means that a design scheme now exists whereby lenses with multiple functions can be designed (two simultaneous focal lengths in a spherical lens, for example, one for each polarization). It also means that researchers working on unusual devices such as optical cloaks that must be designed with transformation optics need not sacrifice one polarization to make their devices work. They can “save” the other polarization, and at least make it do something useful. Thus, a cloaking device can cloak for one polarization, and perform some other interesting function with the other polarization. Various examples of such devices with dual functionality are shown in Figure 2. With the methods developed, birefringence can be fully controlled in dielectrics and useful optical devices designed that have either two functions, or that have identical functionality for each polarization but with different ray trajectories. Acknowledgments: I would like to thank my co-authors on the Nature Photonics paper , Prof. Tomas Tyc of Masaryk University and Prof. Ulf Leonhardt of the University of St. Andrews. Funding from the Singapore Ministy of Education Tier II Academic Research Fund under grant MOE2009-T2-1-086 is acknowledged. Danner A.J., Tyc T., and Leonhardt U., "Controlling birefringence in dielectrics," Nature Photonics 5, 357 (2011). Abstract. Service, R. F. & Cho, A. "Strange New Tricks with Light", Science, 330, 1622 (2010). Abstract. Leonhardt, U. "Optical Conformal Mapping". Science, 312, 1777-1780 (2006). Abstract. Pendry, J. B., Schurig, D. & Smith, D. R. "Controlling Electromagnetic Fields". Science, 312, 1780-1782 (2006). Abstract. Shalaev, V. M. "Transforming Light". Science, 322, 384-386 (2008). Abstract. 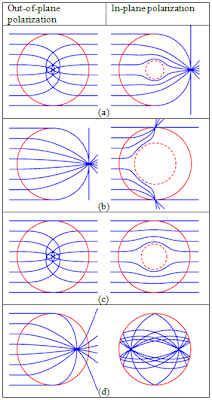 Chen, H. Y., Chan, C. T. & Sheng, P. "Transformation Optics and Metamaterials". Naure Materials, 9, 387-396 (2010). Abstract. Leonhardt, U. & Philbin, T. G. "Geometry and Light: The Science of Invisibility" (Dover, 2010). D. Schurig, J. J. Mock, B. J. Justice, S. A. Cummer, J. B. Pendry, A. F. Starr and D. R. Smith, "Metamaterial Electromagnetic Cloak at Microwave Frequencies", Science, 314, 977-980 (2006). Abstract. Ma, Y. G., Ong, C. K., Tyc, T. & Leonhardt, U. "An Omnidirectional Retroreflector Based on the Transmutation of Dielectric Singularities". Nature Materials, 8, 639-642 (2009). Abstract. Kwon, D. H. & Werner, D. H. "Polarization Splitter and Polarization Rotator Designs Based on Transformation Optics." Opt. Express, 16, 18731-18738 (2008). Abstract.